Choose two texts of up to six pages each to illustrate. Make sure that you choose texts with quite different requirements, for example a novel and an art history textbook or a book of verse and a business manual. Once you’ve selected some images, plan how you would integrate each one into the text. Give careful thought to the size and orientation of the images as well as techniques like cutting or bleeding. 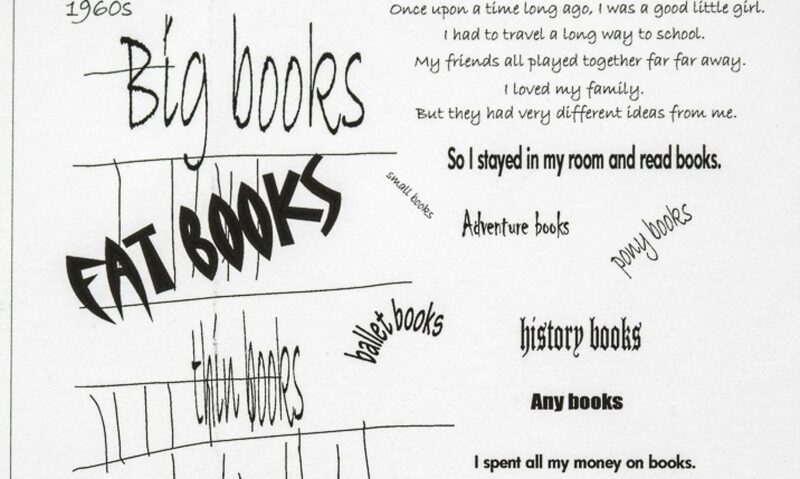 Generate an enlarged copy of each of your chosen texts and mark up where and how you would illustrate them. For each image, write short notes, for example ‘cut-out image, approx. x cm by y cm’. Don’t overdo it. Remember that the illustrations are there to complement and enhance the text – not to distract the reader’s attention. This was an idea I have been thinking about as part of some work on Art Photography for illustrating poems, but I had never followed up on the ideas till now. The inspiration here started with the images I had taken on a walk in Holmfirth, a very sunny day with flickering light and shadow. I found them very interesting when I converted the colour images to high contrast Black and White. They reminded me of the poem Jabberwocky – but a rather sinister version. This had been a favourite poem of mine when I was a child. I researched the poem in Wikipedia and followed the weblinks from there to find out more about the meaning of the words as intended by Lewis Carol. This is one of the pieces I am most proud of from my work in this course – I enjoyed doing this very much. This is the sort of work I would be very interested in pursuing further. I started here by editing some text from Lonely Planet Guide to Venice. For this project I found it more straightforward to work directly in InDesign as I am still experimenting to push the limits of what it will do. I found I had to cut a lot of the text to bring it down to 6 pages and integrate with the images. I put a lot of the text into Boxes. The final version I changed the title to read vertically to integrate better withy the image, edited some of the text down to balance the columns and worked a lot on pages 4 and 5 to make the image layout more dynamic. The photos I used were my own from my holiday. Finally, make a note of any copyright issues around your chosen illustrations. You’re not expected to produce fully-designed pages. The aim of this exercise is simply to start you thinking about the relationship between text and artwork. Think of this simply as a set of preliminary ideas that you might submit to a publisher. Have fun with it. On this project maybe I missed the point and did my own versions rather than mockup. I found it more straightforward to work directly in Photoshop and InDesign as I am still experimenting to push the limits of what it will do. I also found it necessary to work with the images and text combined, editing and combining each as I went along. I want to look much more at uses of image and text in the context of research on Photobooks for my Landscape Photography course. Also add some examples from Manuals I do for my work. Although only two texts were required for the project, I also worked on a text that I was designing for work. This text is part of a Toolkit for a methodology I have developed for helping women, men and youth analyse whether or not work, expenditure, decisions and ownership of assets are balanced in their households and decide what they want to change. So far I have been designing short tool sheets. Longer manuals have been handed over to professional designers. For the tool sheets I design I try to make this client-led in terms of colours and fonts. But this is not always easy – in Tanzania they wanted bright blue and yellow for the flag and Comic Sans font. So I am in the process of trying to work out a much more attractive generic design for these. The following still need a lot of work once I have had comments back. Because of lack of time I was not able to work further on this to submit for assessment, but am producing different versions for different clients as part of my professional work.